8 Things I Learned About Teaching with #OpenBadges | Kira J Baker-Doyle, Ph.D. In September of 2014, I decided to embark on a a teaching odyssey of sorts. I went on a mission to learn about how to use (and teach about) open digital badges in the classroom. This post is the third and final in a series of my reports on my journey. The first two posts (#1 & #2) give a little background as to why I decided to try badges and the evolution of their use of my classroom. I promised a final post that would shed some light on what I learned, and here it is! I should caution the reader that I am still learning, and will likely develop a few new opinions or ideas in the future. However, I do think there are some worthwhile strategies and tips that have emerged through this process that interested educators might benefit from reading. I want to thank all of my students for working with me to learn about how to use open badges in an effective and meaningful way. Tip 2: Be Makers. Teach students to use http://www.openbadges.me or any other kind of software that will allow them to make badges for themselves and others. This is truly where you as the teacher will be able to see more of what students are learning and valuing in each others work. Who knows, you may earn a badge or two in the process that you can brag about later. Did I mention I earned the “Good Listener” badge from one of my students (it’s on my front page)…. Tip 3: Make a few standards. Some students have trouble understanding what badges are or what they can do to earn them unless you put a few out there for them to work towards. For those students, its a great motivator to have something to work toward that they can chose to pursue. Tip 4: Keep it low stakes, One of my biggest mistakes early on was to tie my badges heavily into the grading system. In retrospect, this may have worked after a bit of time adjusting to and learning how to use badges, but it was very stressful for students to have such a new way of evaluation or credentialing attached to their grade outcomes. Unless students are familiar with badges and you have some very strong and clear policies in place, I would suggest keeping open badges outside of the traditional grading system. Tip 5: Look for the good. Using digital badges invites instructors and learners to take a broader look at the ways individuals are contributing to the learning community. Try taking a step back and asking, What are some ways I am seeing my students contribute to our learning or demonstrating a skill that I wouldn’t traditionally recognize in assessment or grading? It may just be their ability to make connections between ideas or to bring a positive attitude into the classroom. Use badges as way to celebrate the whole learner. Tip 6: Make space: In order for open digital badges to have legitimacy in the community, it is critical to have a space in which they are shared and displayed. We used G+ in our class, which was a nice venue to comment, share, and show off our badges. Yet, instructors can use any platform. It is important to have a space that allows students and instructors the opportunity to explain why someone earned or deserves a badge. Tip 7: Play around. Open badges provide opportunities to recognize students in new ways, so why not create some new ways to recognize students? For example, This semester I held a crowdsourcing contest on one of the infographics projects that students completed. The “winner” didn’t receive a higher grade, but rather recognition – a badge. It was a fun way to engage students in going beyond traditional assignment work if they chose to do so. 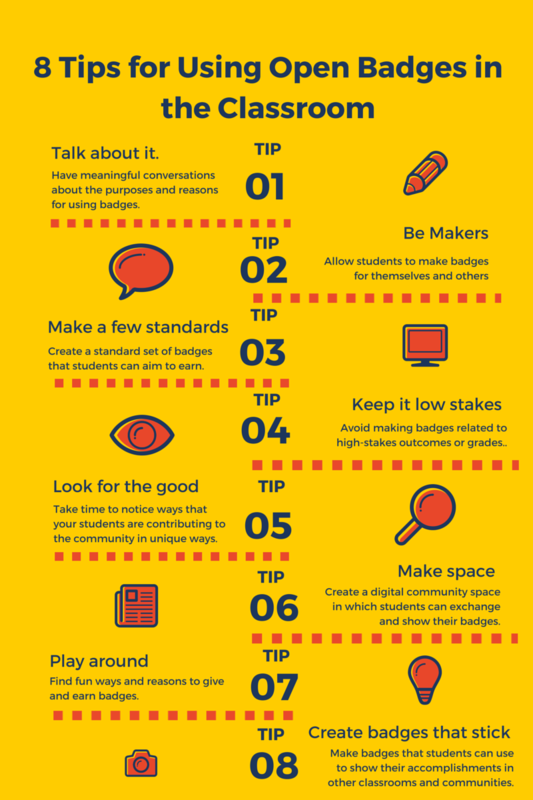 Tip 8: Create badges that stick. While some students may be generally disinterested in badges, a few will really enjoy earning, collecting, and sharing badges. They can do so even after they leave your classroom, especially if they earn badges that demonstrate mastery in skills or areas that may be applicable in multiple contexts. The infographics badge is a good example. This badge is given for mastery of a particular skill, and one that students may want to include in an online portfolio or collection of work. Something I’d like to work on in the future is providing a list of the criteria that a student met in order to earn a particular badge. This may help them and others understand what they accomplished in order to earn the badge. Badges can be a great tool to foster community, recognize learners in unique and interesting ways, and provide students with a record of their accomplishments beyond the traditional grading structure. If you give open badges a try in your classroom, please share your tips – I’d love to be able to add to the list! This is a great way to enhance student-led conferences! Thanks, Kira!